What is A/B Testing Tutorial? To differentiate two or more versions of a web page or an application, we use A/B Testing. It aids the user to determine which of them is better and showcase better conversion rates. It is the easiest way to examine an application or a web page for creating a new version which is more effective. 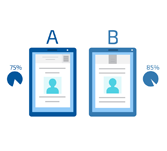 This tutorial explains the concepts and fundamentals of A/B Testing with desired examples which can put into practice. Professionals who are into Software Testing domain are the right audience to this tutorial. It provides enough depth into the concepts of A/B Testing. In order to understand the concepts of A/B Testing, readers should have basic knowledge of HTML and hand some experience of handling a website. It is appreciated, if the user have an elementary knowledge of Data Analysis and Conversion ratio of websites and mobile applications.